Make sure that your in-store customers earn loyalty points for every purchase. 📝Note: If the customer isn't yet part of your loyalty program, tap Add a new customer and enter their First Name, Last Name and Email Address to the sale. Your customer will automatically receive their loyalty points once the sale is completed in Vend. If you have the Earned Points Email notification turned on, they will also be notified by email. If you have your Earned Points Email turned on, your customer will automatically be notified by email. 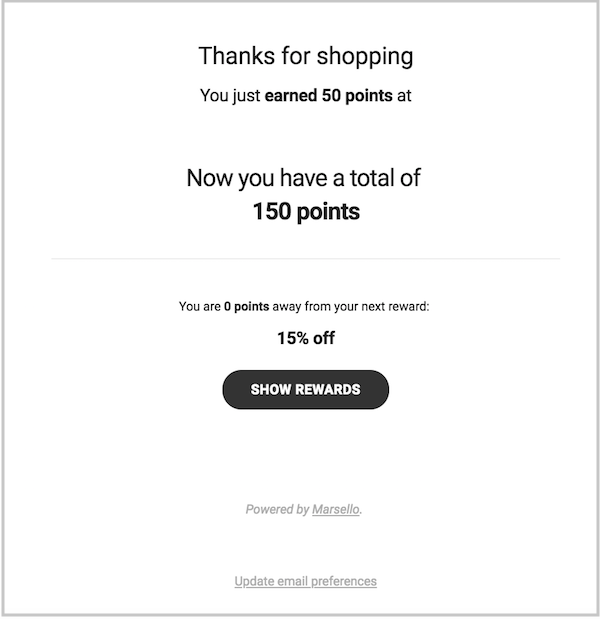 This email will let them know how many loyalty points they have earned, their new loyalty points balance, and how many points they are away from their next reward. At POS, make the experience of earning loyalty points exciting for your customers. This will encourage your customers to be more engaged with your loyalty program and get them excited to unlock their next reward.